30” (762mm) circular ceramic clad steel cooking surface. Variable temperatures 225ºF to 625ºF (121ºC to 329ºC). 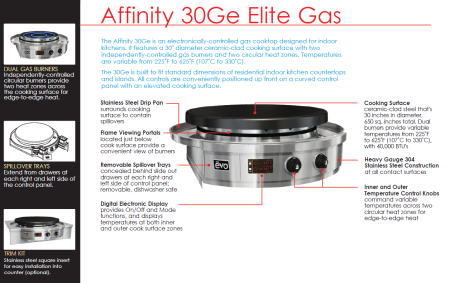 Electronically monitored dual independent gas burners. Inner burner 13,000 BTUs; outer burner 24,000 BTUs. Analog knobs separately control inner and outer burners. Digital temperature display for inner and outer zones. Natural gas or LP propane gas option. Install to steel, or combustibles with 3/8″ minimum clearance. Circular cook surface and radius control panel extends your design possibilities. Steamer lids and roasting racks included. Use the Affinity Elite Gas to: saute, braise, flattop (plancha) grilling, pan fry, roast, poach, steam, toast. 25” (635mm) circular ceramic clad steel cooking surface. Variable temperatures 150ºF to 525ºF (66ºC to 274ºC). Electronically-monitored dual independent heaters. Analog knobs separately control inner and outer burners. Digital temperature display for inner and outer zones. Inner heater zone: 1220 watt; outer heater zone: 3140 watt. Install to stone or wood with zero clearance requirement. 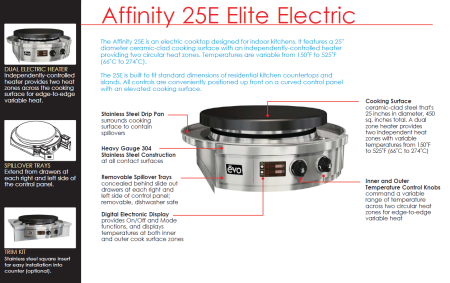 Use the Evo Affinity Elite Indoor to: sauté, braise, grill, fry, pan fry, roast, poach, vegetable and starch preparation. Cooking surface is extremely durable and easy to clean. Electric heater is protected against spill overs.